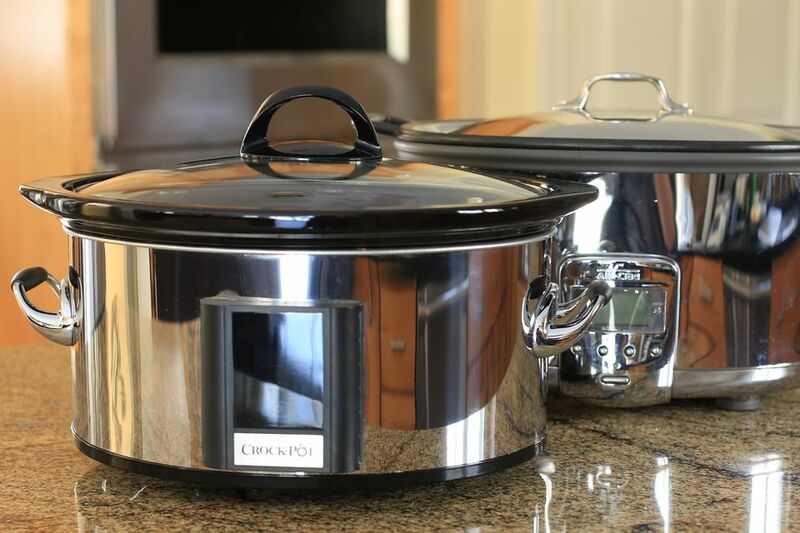 Many of your favorite recipes can be successfully adapted to the Crock-Pot® (made by Rival Products) or slow cooker if you follow a few simple rules. Here you'll find a basic time/temperature guide for converting recipes, some do's and don'ts for specific ingredients and a few tips for making your slow cooker dishes more flavorful. Dense vegetables like potatoes, carrots, and other root vegetables should be cut no larger than 1" thick, and placed in the bottom of the pot since they take longer to cook. Usually, liquids may be decreased in slow cooking - about half the recommended amount. Unless the dish contains rice or pasta, one cup of liquid is usually enough. If a recipe calls for cooked pasta to be added, cook it until just slightly tender before adding to the pot. Add 1/4 extra liquid per 1/4 cup uncooked rice, and use long grain converted rice for the best results. For long-cooking recipes, add cooked rice shortly before serving. It's best to soak beans overnight before cooking them in the crockery cooker. The Rival brochure recommends pre-soaking then boiling for at least 10 minutes in unsalted water, draining, then add to the recipe. Before adding sugar or acidic ingredients, the beans should be softened first, either in the slow cooker or on the stovetop. If your recipe includes tomatoes, salt, or other acidic ingredients, the beans should be tender before beginning. Ground herbs and spices tend to dissipate over long cooking times, so it's best to add them near the end of cooking. Whole herbs release flavors over time, so are a good choice for crockery cooking. You should taste and adjust seasonings, if necessary, before serving. Milk, sour cream, and cream break down over long periods of cooking and should be added during the last hour. Condensed cream soups are good substitutions for milk and can be cooked for extended times. "Healthy," or reduced fat condensed soups can be used in any recipe as a substitute. Add water only to cover ingredients in the soup, and add more after cooking if necessary for a thinner soup. For milk based soups, add 1 or 2 cups of water and during the last hour, stir in milk, evaporated milk, or cream as called for. Over long cooking, some dishes may lack flavor, but some extra preparation steps can be worthwhile. Though it isn't necessary to brown most meats first, the flavor is often enhanced by browning, and fat is decreased. Dredging meat or chicken in flour, browning, then deglazing the pan with wine, a little vinegar, or broth and adding that to the pot can make quite a big difference in flavor. For the best color and texture, ground beef is best browned before using, except in meatloaf or other similar dishes. To simplify preparation, brown ground beef, drain and freeze in batches for your crockpot meals. To make a flavorful sauce or gravy from your cooking liquid, first, make a roux of flour and water (roughly 1 tablespoon of each for each cup of liquid) in a medium saucepan. Skim the fat from the cooking liquid in the slow cooker then add the liquid to the roux. Simmer, stirring, until the sauce is thickened and reduced. Serve with or over meat and/or vegetables. You can also add cornstarch dissolved in water (1 or 2 tablespoons cornstarch to 2 or 3 tablespoons cold water, depending on how much liquid you have) directly to the slow cooker near the end of cooking to thicken the liquids.